Guests wanting a haircut can stop by the Harmony Barber Shop, located on the corner of Main Street, U.S.A., between City Hall and the Emporium. 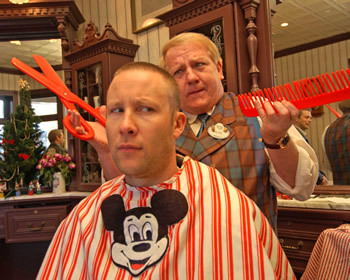 Harmony Barber Shop transports Walt Disney World guests to a simpler time … a time when barbershop quartets entertained with harmonic tunes and when getting a haircut (or two) was a real treat. Hair tonics and talcum powders line the dark burgundy shelves. The Dapper Dans barbershop quartet strolls by daily, singing melodious tunes in perfect harmony and entertaining guests with their humorous banter. First haircuts are a specialty here, with the young ones treated to extras including Mickey stickers, a special “My 1st Haircut” set of Mouse Ears, a certificate and pixie dust. The first haircut package costs $18 (+tax). Haircuts for children age 12 and under are priced at just $15 (+tax). Those over 10 will be charged $19 (+tax). Styling with colored hair gel & Mickey confetti (no cut) is $7.50. Styling with pixie dust or pirate dust is $5. Beard and mustache trims are $10. Reservations recommended. Book up to 180 days in advance by calling 407-939-3463. A credit card guarantee is required. No-shows and cancellations within 24 hours of appointment time will be charged $10. Hair must be clean and dry as shampooing is not available. Guests aged 17 and under must have a parent or guardian present. Some of the antiques in Harmony Barber Shop are still in service. A turn-of-the-century Western Electric phone box is still used to make phone calls. Also of note is the cash register the barbers use to ring up their sales. It dates from 1912. The shop performs between 350 and 400 services a week.